Born Salisbury, North Carolina, October 18, 1938; admitted to bar, 1967, North Carolina. Wake Forest University (B.A., 1960); University of North Carolina (J.D., 1967); Phi Delta Phi. Research Assistant, North Carolina Supreme Court, 1967-1968. North Carolina State Bar (Member, board of Legal Specialization, 1989-1995); North Carolina (Member, Real Property Section) and American (Member, Section on Real Property, Probate and Trust Law) Bar Associations; [Lt. U.S. Army, 1960-1962]. Elizabeth City Rotary Club; Former Member Board of Trustees, Elizabeth City State University. Fred Riley was born in Salisbury, NC, and earned his degrees from Wake Forest University and the University of North Carolina at Chapel Hill. He was admitted to bar in North Carolina in 1967. He served as Research Assistant to the North Carolina Supreme Court, and is a member of the NC State Bar, as well as a Member of the Board of Legal Specialization. 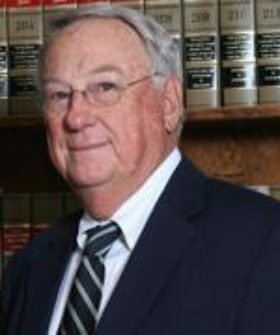 Mr. Riley is a member of the the American Bar Association, as well as a Member of the Section on Real Property, Probate, and Trust Law. He also served in the U.S. Army from 1960-1962. Mr. Riley is a member of the Elizabeth City Rotary Club and is a former Member of the Board of Trustees for Elizabeth City State University.